The National Museum in Paço de São Cristóvão (Palace of Saint Christopher) is Brazil's natural history museum, exhibiting dinosaur fossils, mounted animals and insects, minerals, and meteorites, as well as archaeological artifacts and aboriginal utensils. 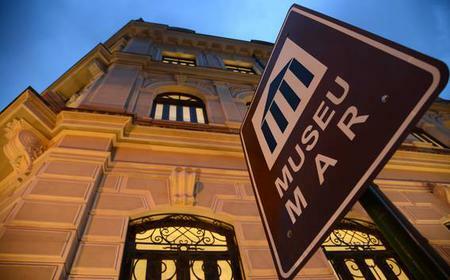 ...dicated guide, ride in a private vehicle to Museu de Arte do Rio, Museu do Amanhã and the Museu Nacional de Belas Artes. The National Museum in Paço de São Cristóvão (Palace of Saint Christopher) is Brazil's natural history museum, exhibiting dinosaur fossils, mounted animals and insects, minerals, and meteorites, as well as archaeological artifacts and aboriginal utensils..